There’s a blessing in the inadequacy of widowhood and of saying, “Lord, You KNOW that I can’t do this. I can’t be a widow. I need Your power in my life to get through this and to go on living.” Would God call me to do something and then separate Himself from me? Can I say that God won’t help me live life alone without my husband? Am I willing to do whatever God requires of me and to say, “ God, here I am. Whatever there is of me that You can use, I’m available”? Since He died on the cross and paid my sin debt for me, do I have a right to tell Holy God what I will or will not do? Would God call me to do something that I cannot do in His strength and His power? I have access to THE COUNSELOR who created me and planned my life for me. He is willing to show me exactly what to do. Whatever I need, God will overflow it in my life. No matter who I am, God has a place for me. He does not want me wasting time and influence on what impact I can have. He wants me to look at myself in the light of how God sees me and the potential I have – not in my own strength but in His. I need to keep my heart clean, recognize my inadequacy, acknowledge His sovereignty, and be willing to do what He has for me to do in the days ahead as a single woman – a widow. He’s willing to give me a new beginning and a new start and enable me to be the person that He wants me to be. I have the awesome privilege to get on my knees before God and talk to Him who will never make a mistake, never mislead or inform me, and never fail me. God has a HUGE investment in me – The Cross. Do I have the right to withhold myself from my Creator who values me, has committed Himself to live in me for all eternity and enables me to face every single circumstance adequately? The blessing of inadequacy is that if I respond to it in the right way, it pushes me to God. My birthday was a little over a month before my husband went to heaven. For the first time in our married life, he couldn’t go out to buy me a birthday present and that bothered him. He told me that he had noticed that some of the pages in my Bible had come loose and he wanted me to go online and buy myself a new Bible as my gift from him. I guess I wasn’t getting that done fast enough because he continued to ask me (which was unusual for him) if I had ordered my new Bible yet. Of course now I know why this was so important to him – it was his last gift to me. I highly treasure this Bible and inside I have a place where I write down any dreams I have about him. He came to me in my dreams the first time on January 1st, 2010 – the night before my Mother joined him in heaven and I will never forget that dream. He looked wonderful and had the biggest most joyous smile on his face as he exclaimed, “Hey, Bert! I feel SO GOOD! !” Then he very excitedly pulled up one of his pants legs and said, “LOOK!” as he showed me that his legs weren’t horribly swelled anymore . He was whole and well again. God knew how much I needed that dream. He knew how much I needed to hear Bob tell me himself that our prayers had been answered – not in the way we had prayed, but in the way that God had planned for him. There have been some other dreams and they all haven’t been pleasant. Dreams are a way that we process our emotions and thoughts in our grief. They help us realize what things we need to deal with and then let go. In one such dream my husband told me that God had allowed him to come back to me for a little while so that I could get used to the idea that he was going away soon and never coming back. In that dream he paid no attention to me and that was very, very painful. Then he left and was gone. I knew from the message of that dream that I am trying to process the fact that I have to accept his death before I can move forward in my grief journey. Thank You, God, for using my dreams to point out what I need to do to process through this time in my life. Thank you for reassuring my heart that Bob is so happy and well again and for the hope of what is ahead for me. Thank You for comforting me even in my dreams. Wiphan Widow Care and Support from Wiphan Care Ministries on Vimeo. In Africa and especially Zambia, when a widow loses a spouse they believe the ghost of her deceased husband stays with her. Therefore, she becomes an outcast in the community. Extended family will come after the burial and rob the widow and her children of all of their belongings—and even take their home leaving the family on the streets to defend for themselves. The extended family and community breaks all ties with the widow and her child…leaving them not only broken-hearted but defenseless. Unfortunately, this is the story of 90% of Zambian widows as the culture is surrounded by superstition. It is our heart to not only defend the widow, but to encourage, teach and lift them up in truth. Help us defend the widow by becoming a sponsor of our widows program. Wiphan offers a two year program for widows in the community where they can come to our school for free and learn a trade–with the opportunity at the end of the program to receive a micro-loan and start their own businesses. While in our program, the widows are surrounded by Christian leadership and are invited into a new community of believers which not only builds up our widows but takes away false beliefs the community believes. With $25 a month, you will be investing in the lives of 100+ widows enabling them to provide for their own family–and often even for orphans whom they have invited to also join their family. Many of our widows come to our program broken hearted and with feelings of rejection. We believe it is just as important to support them by giving them in skills training as it is to build up and encourage their hearts. Wiphan invites you to walk alongside a widow to provide Biblical affirmation, prayer support and a loving friendship. When you sign up to be a Widow Cheer-giver, Wiphan will assign a widow to you and we would ask that you regularly pray for her and you will have the opportunity to send your widow special letters of encouragement and pictures approximately 4 times a year (each quarter). Wiphan will contact Cheer-givers a few weeks before each trip so you have time to prepare and mail your letters in. Your letters will be hand delivered to your widow. Please keep in mind not all of our widows can read and write—but rest assured our staff will carefully translate every word. Imagine how special and loved each of our widows will feel when they discover they have a friend across the world that not only cares for them, but who desires to pour into their lives and love them. To defend a widow or become a Cheer-giver, simply go to this website and fill out the form at the bottom of the page. Death is death, sudden or long-term, and we all grieve the same way. By keeping busy I can lessen or eliminate my grief. I must be going crazy or “losing it”. I need to make sure I don’t grieve for too long–one year should be enough. If I express my anger at God or the circumstances of the death, I am a bad person and will “pay” for it. I won’t have to grieve as much and I will feel better if I use alcohol or medication to alleviate my sadness. Shouldn’t I be strong enough to “tough it out” by myself? I’ve done something wrong because my family and friends are turning away from me. Not only is the sudden death of a spouse dealt with in this writing, but also losing a parent, losing a child, losing a sibling, and losing a friend. Death by suicide or when tragedy causes multiple deaths is also discussed at length and those who have suffered a loss due to something like this will find it most helpful. Noel and Brooks suggest that there are themes of grief by years: First Year….a First Time for Everything, Second Year…..Reorganizing, and Third Year…..Regaining Equilibrium. Purpose: To survive the shock of our loss while tending to the basics of reality. Purpose: To find a beginning, middle, and end so that we may cease obsessive thinking. Purpose: To acknowledge the reality of our loss and fully grieve our loss. Purpose: To release ourselves from unnecessary pain through the act of forgiveness. Purpose: To explore, define, rebuild and repair our faith in life and/or in God. Purpose: To understand that even the deepest tragedy can bring meaning, and to uncover that meaning. Purpose: To understand the void that has been created by our loss and how that void will change our personal belief system. Purpose: To integrate the discovered meaning into our day-to-day lives. Purpose: To take responsibility that life is ours to be lived to its fullest. 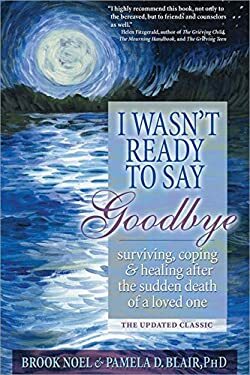 I found this book to be one of the most thorough resources for grief whether you have lost a loved one suddenly or not. This review has only begun to touch on its riches. Heartfelt thanks go out to Brook Noel and Pamela Blair for all the hours and hours of interviewing and research that they spent to bring us this book. “God created us to have emotions. It does no good to pretend they do not exist. I have fought against and suppressed my emotions, but that never seemed to help. They were always there, ready to rear their ugly head at a less-than-opportune time, and usually with greater intensity. For the last 6 years my faith has been under tremendous pressure. I thought I was doing pretty well for those first few years, but the last 2 ½ years I’ve felt such a great tightening of the vice grips that the pressure has been unbearable except for the grace of God. A person can’t imagine pressure like this unless they are going through it. They can have no concept of it nor can they empathize much less sympathize with another unless they’ve experienced the same themselves. I accepted Christ into my life as a 9 year old girl, but I did not begin to grow in my relationship with Christ until I was a senior in high school. My future was bright. Nothing but happiness and sunshine shone ahead. There were a few bumps along the way, but no real shadows that threatened to stay. I met the man of my dreams when I was 19 years old – quite without looking for him. Wonder of wonders, he loved me for who I was and all was so well with my world. We married and soon began our family. The arrival of 4 beautiful daughters graced and blessed our home and we embraced the challenges of teaching and training them. We experienced no rebellion from them during their teenage years and there was harmony and smooth sailing in our home. They weren’t perfect, but they were obedient and what parent could ask for more from their children. One by one each daughter was found by their future husband and we watched as they joined them to begin homes of their own. Grandchildren began to arrive and my husband and I understood and loved the joy of being a grandparent. All the while we were growing spiritually, but it wasn’t until my husband received a terminal diagnosis at age 54 that life as we knew it stopped and began to revolve around that. Suddenly our faith was under pressure and we were being crushed from ever side. For the first time I was able to see just how strong in faith Bob was and I was amazed. Not once did he ever complain or verbally ask God “Why? !” He seemed to take everything in stride and accept it. I did my best to follow his example and chose not to even allow myself to entertain the possibility that he could leave this earth without me. That was totally and completely unacceptable to me and surely it was to God as well. After all, He gave me this man to be my husband and to care for me. We were enjoying the years of empty nesting and growing old was something that we were going to do together. Bob did so well for awhile. In fact, he felt the best that he’d ever felt in his life and I was sure that the dark shadow that had fallen across our path was fading. But the day came when suddenly he began to feel badly and then he went downhill very quickly. Pressure such as we had never experienced descended on us and we withstood it – together. On November 10, 2009 the release of Bob’s pressure of faith produced a brilliant diamond as he saw his Savior’s face for the first time and rejoiced as he heard, “Well done, my good and faithful servant!” But my pressure of faith continues. Each morning I have to tell myself “Just focus on today, Candy, and remember Bob’s example”. Yes, there are other examples of results of pressure of faith in the Bible, but the one that is the most real to me is my husband. When he was given a bad diagnosis, he didn’t view it as a ticking time bomb. He looked at it as his opportunity and his platform to share his faith with those around him. And because of the pressure he was going through, others were more willing to stop and listen to what he had to say, to consider their own mortality, and to question their eternal destination. I saw his faith grow stronger especially when he began to grow weaker. Faith under pressure. I know what it will produce when my life ends. What will it produce in my life as a widow here and now on this earth? Though you should reach out to others as you do the work of mourning, you should not feel obligated to accept the unhelpful responses you may receive from some people. You are the one who is grieving, and as such, you have certain “rights’ no one should try to take away from you. No one else will grieve in exactly the same way you do. So, when you turn to others for help, don’t allow them to tell you what you should or should not be feeling. 5. You have the right to experience “griefbursts”. Sometimes, out of nowhere, a powerful surge of grief may overcome you. This can be frightening, but it is normal and natural. Find someone who understands and will let you talk it out. You may find yourself asking “Why did he or she die? Why this way? Why now?” Some of your questions may have answers, but some may not. And watch out for the clichéd responses some people may give you. Comments like “It was God’s will” or “Think of what you have to be thankful for” are not helpful and you do not have to accept them. Reconciling your grief will not happen quickly. Remember, grief is a process, not an event. Be patient and tolerant with yourself and avoid people who are impatient and intolerant with you. Neither you nor those around you must forget that the death of someone loved changes life forever. 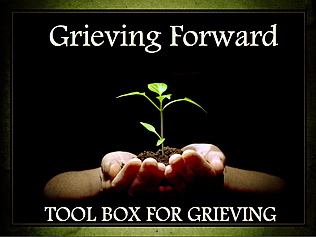 This morning I heard a message on Hebrews 12: 1-3 and thought about how I as a widow am to run my grief journey. 1. I am to keep in mind those widows who are my examples. I need to think about their faith and how they are responding to God. If I don’t know any widows, I need to find and read books about other Christian widows. 2. I am to keep in mind their trials and tests. There’s no promise in the Bible that we are going to live life without any problems. 3. I am to keep in mind their triumphs over frustrations and fears, etc. 4. I am to keep my body free from all hindrances – TV, facebook, twitter, any weight that is not essentially sinful, but is holding me back. No runner runs with a lot of overcoats on. 5. I am to keep my body free from sin. Beware of the vulnerability of widowhood. 6. I am to keep my legs on the move. I mustn’t stop or get stuck in my grief journey. I must keep moving forward. 7. I must keep my feet on the course and stay in my lane. I can’t look around at other widows to see where they are in their race and compare myself to them. 8. I must keep my eyes on Jesus the Author and Finisher of my faith – my Prize. 9. I must keep my heart in tune and in shape. Beware of being discouraged. Consider what Jesus went through for me and as I think about His sufferings, I’ll see mine in perspective. 10. I must keep from being disobedient to what God wants for me. In the last week or so, I’ve been in lots of communication with Labstone’s wife…a dear friend of mine…by the name of Sarah. It’s hard for me to grasp what she is going through…losing a husband–having 3 small children left at home to care for…and as IF that wasn’t hard enough…the culture in Zambia makes it even harder. After a woman loses her husband in Zambia–several things usually happen. Most of these have happened to our sweet Sarah this week. A friend. You watch your loved one pass while little medical care is done…and then the cousins, aunts, uncles of your husband from near and far show up at your door step. You are expected to feed them, care for them…all the while your heart needs to be alone or just care for the needs of your precious children. Days after the funeral–you go to court. Every family must do this–and the judge names a family member on the husband’s side the “estate owner” of what little you have left. This gives the 15 guests in your home permission to finally leave…with ALL of the things you and your husband slowly and sweetly acquired together through your years. The sofa…you painstakingly saved for so your children would have a place to sit. The deep freezer–YES a true luxury in this culture–but it meant your children would be able to have milk, meat and a source of protein as they grow. You sit there and watch as they walk out with each thing…knowing it is safer for you and your children to just sit there and watch. Too many tears have been shed this last week…it’s better to just pull him close and let this go. If you fight back–you risk being ridiculed and beaten…and you know this would be too much for your children to hear and see. And you also know–after you are ridiculed and beaten…they will take it any way. So there you sit…just 1 week after losing the love of your life…with your 3 children…all alone. And this is the reality of every widow in Zambia. I told sweet Sarah yesterday what *I* would have done if *I* were there…which made her LAUGH–and she told me that my idea would have never worked:). I’m sure she’s right. She did all she knew she could do–she watched, she took it all in and she loved and protected her children. Because she is my friend–I want to scream. But that really won’t help. We could just send her money–but we also have to be very careful how we care for her and how we best take care of her and equip her to care for her children…for the long term. We are committed to loving her and guiding her as she picks up what little she has left…and starts all over again. If you would like to be a part of helping Sarah’s family for the long term–you can by going to www.wiphan.org and going to “donate”, choose “one time donation” – and put “Chanda Fund” in the subject line. Any donations made will go toward long-term care of her children and our doing all we can to make sure their family is okay. What’s hard for me…is there are hundreds and hundreds and hundreds of Sarah’s in Zambia. And that is why I think it is VITAL for any orphan organization to also reach out to widows in distress. Over and over and over in scripture–the Word puts BOTH of them together…because they usually come together. Single orphans are children who have lost one parent–and double orphans have lost both. Single orphans are also at risk as the only parent must leave their child some times days and weeks at a time to find work–but by coming alongside the WIDOW in distress…we serve the orphans in ways we can’t even imagine. Sarah came to me with an idea of starting a restaurant. WHAT IF–she employs only widows at her restaurant giving them jobs to better care for the children in their care? Consistent work in the same village–and they could be home at night to protect their children? Often, I think we mull over how to serve orphans–and long for MORE people to be on the ground to help them. WHAT IF–God already placed lots of people on the ground to serve them and they are called widows…only they need to be cared for just as much??? WHAT IF–by taking care of 1 widow…you instead are really taking care of 3 orphans…or 4 or 5??? Wiphan and Tuli One homes are working together to employ a widow to care for 4-5 orphans…giving the widow a job and the orphans a caregiver who feeds them, bathes them, loves them and tucks them in at night. If you would ever like to know more about how you can serve alongside us–we would love to share. Wiphan (WI= widows +PHAN= orphans) Care Ministries is run by the local Wiphan Board in Zambia as well as an American support board in North Atlanta. Both teams work together in hopes of drawing not only the Zambia people to Christ- but also Americans who feel led to join us on this beautiful journey. Together, we desire to give the hopeless hope and follow James 1:27 to “look after widows and orphans in their distress.” Sarah’s husband was on the board of Wiphan. From left to right Donald Mutumba (sitting)/Accounting, Labstone Chanda/School Director, Abby Tumelo/Communications, Kunda Tumelo/Founder-Director of Skills Training, Elizabeth Nokoka/Skills training program and TuliOne program director, Pastor Francis (sitting)/ Pastor, chairman of the board and capital operations.